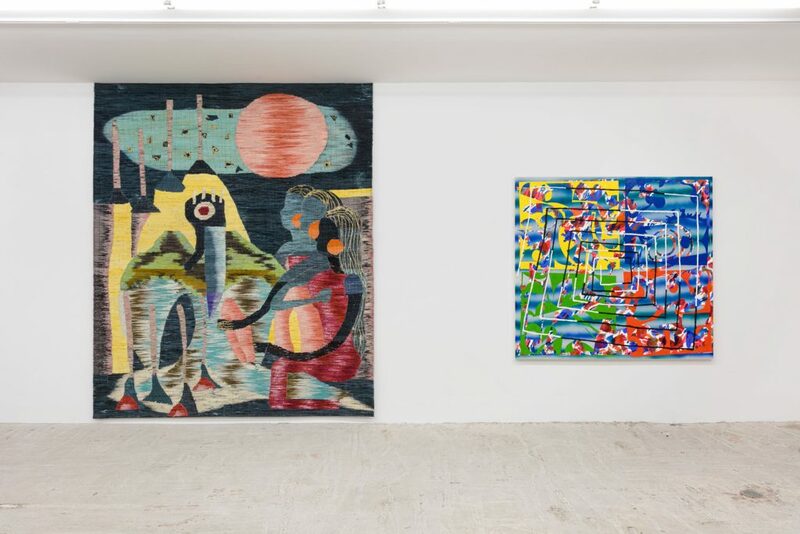 Lyles & King is pleased to present TT52, a two person exhibition of new paintings by American artist Trudy Benson and textiles by the French artist Yann Gerstberger. 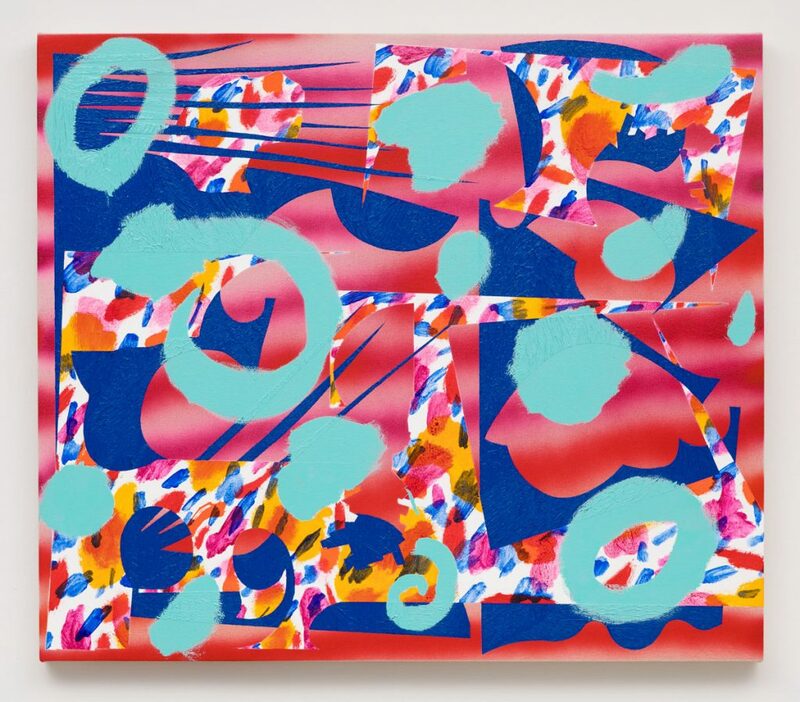 In recent paintings, Benson has shifted her focus from the representation of digital image making techniques to new forms of painted-collage which emphasize the phenomenon of experiencing painting. 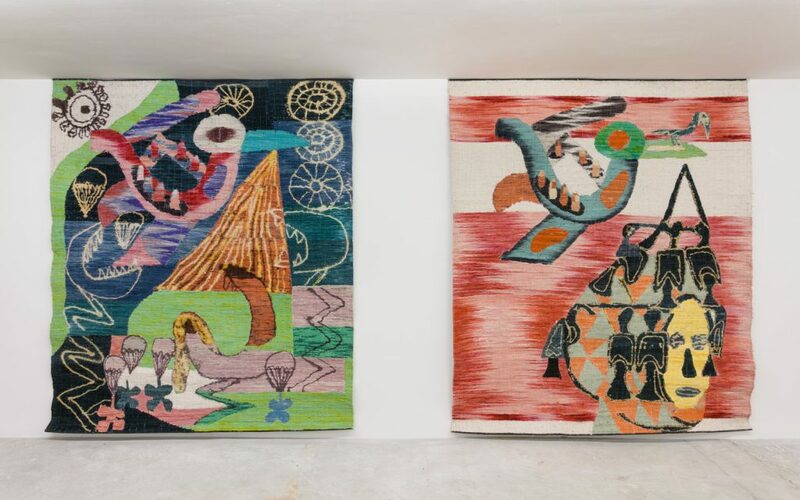 Since moving to Mexico City in 2012, Yann Gerstberger has been making tapestries based upon his natural and cultural surroundings. 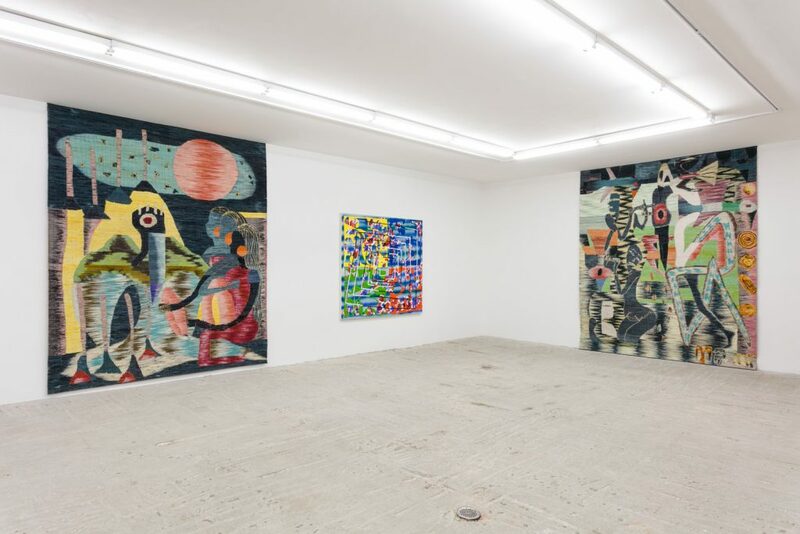 The exhibition title is the archeological reference for the burial site of Nakht, an ancient Egyptian official; while Gerstberger’s vibrant, coded language recalls Egyptian wall painting, TT52 also suggests the excavational mode of looking required for deciphering both artists’ designs. 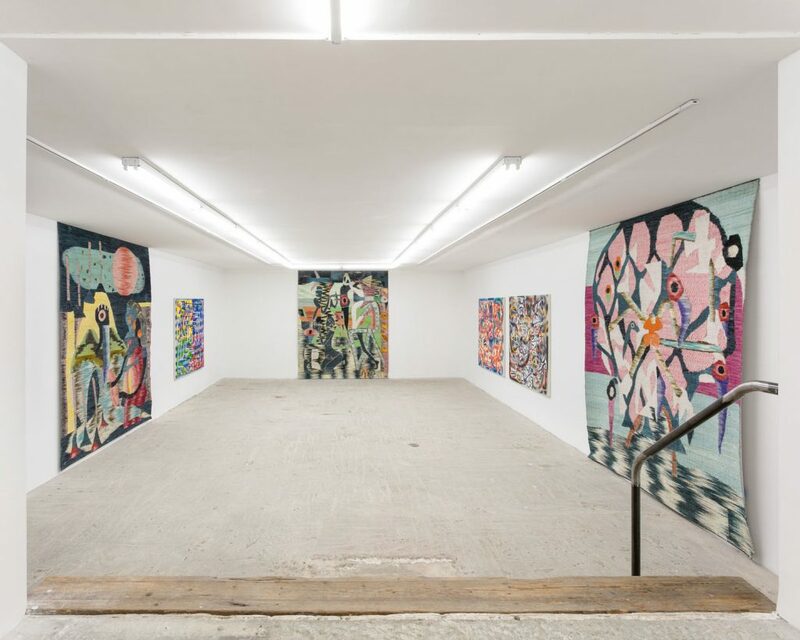 Made with oil paint applied either with a roller or straight from the tube, Benson’s collage-like paintings layer abstract, impastoed forms above a spray painted ground, which diffuses the visual equivalent of static noise through the tiers of the image. 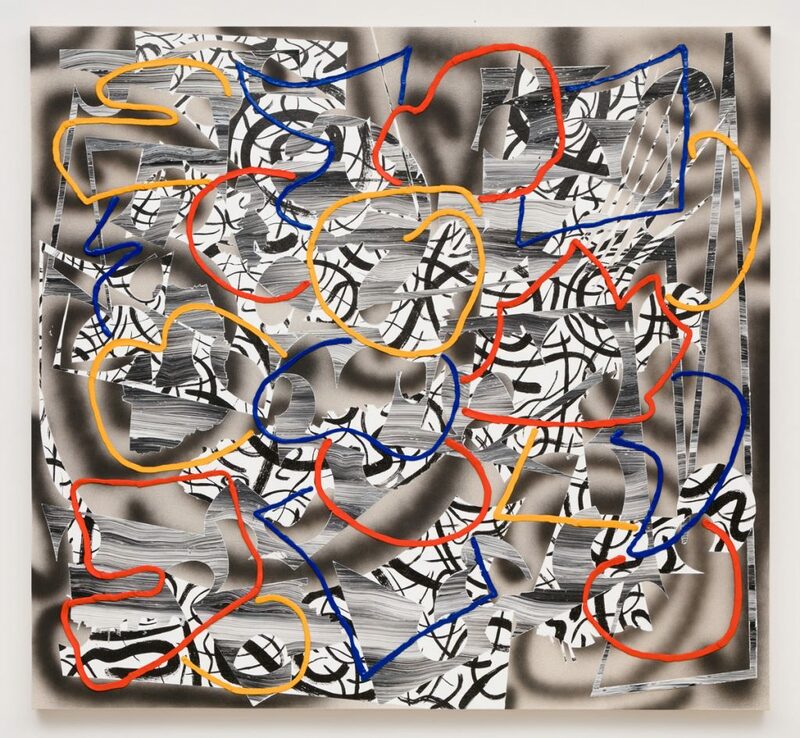 Contrast is key: each layer is discretely striking because Benson mixes a variety of colors and forms as well as temporal references, so that scribbled lines evocative of primitive computer drawing tools mingle with a jumble of jazzy, Matisse cutout-like shapes. In Benson’s jungle of styles, each layer performs via its interactions. Looking at her paintings involves experiencing not only its sensual dynamics but also a new approach to space and time in painting. 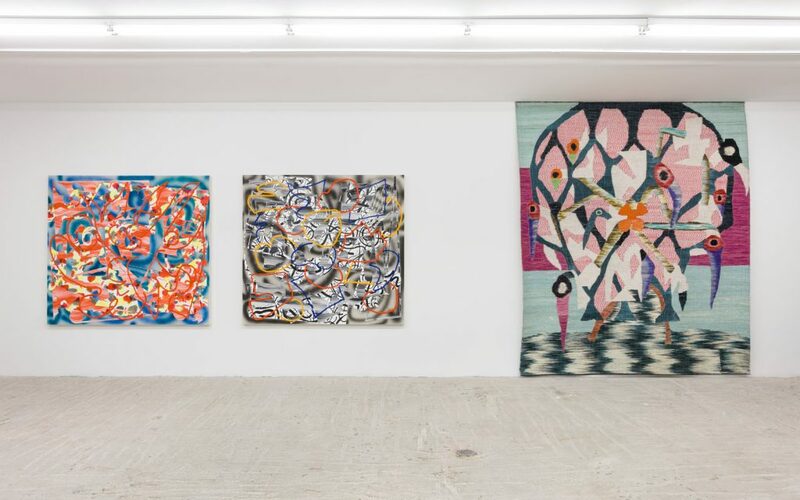 Gerstberger’s colorful and rugged tapestries, made by inserting market sourced fabrics among hand-dyed mop-head strands glued to a vinyl surface, proposes craftsmanship itself as an image making technique. 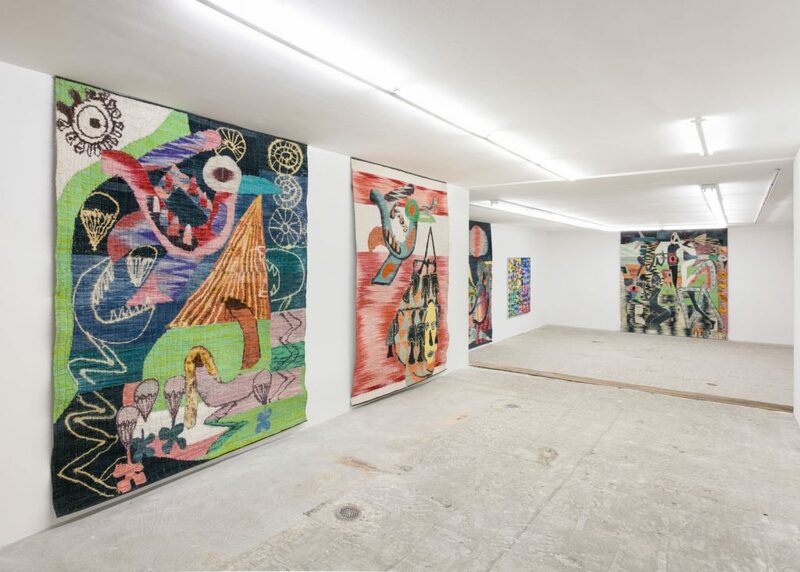 Gerstberger’s visual language is a mostly vernacular one, referencing the comic Fábulas Pánicas, by the Chilean-French artist Alejandro Jodorowsky, and the European fantasy of the tropical, but it also draws from and continues the modernist tradition of his native France. 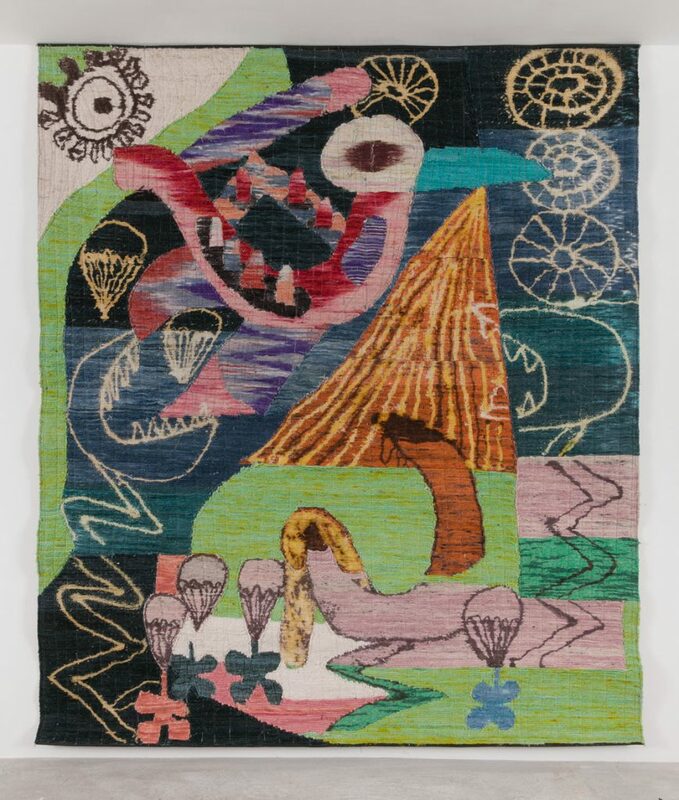 Gerstberger’s works have a haptic quality, owing to the thickness of the cotton threads which encrypt the image by lowering, as it were, its resolution. 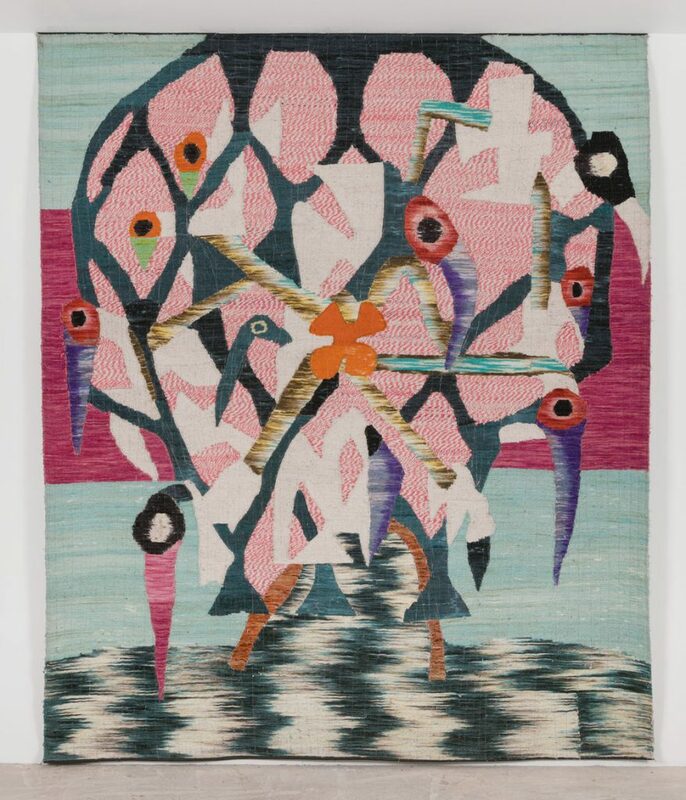 Along with Benson, Gerstberger’s approach highlights two aspects of the artists’ contemporary sensibility. His assimilation of modernist imagery into a Mexican domain (or vice versa) complements Benson’s stylistic mashups. 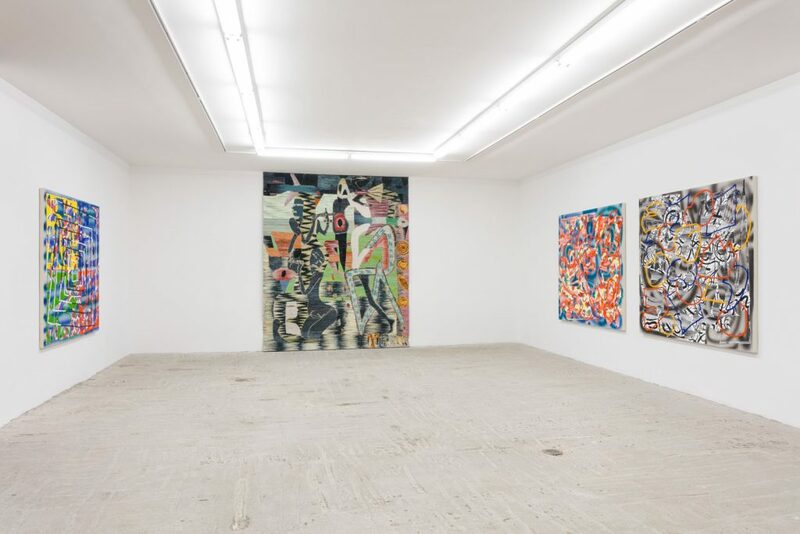 Then, though Gerstberger’s forms are clearly legible from afar or from a photograph, like Benson’s spray paint, the texture of his works interferers in reality with the image’s communicative ability. 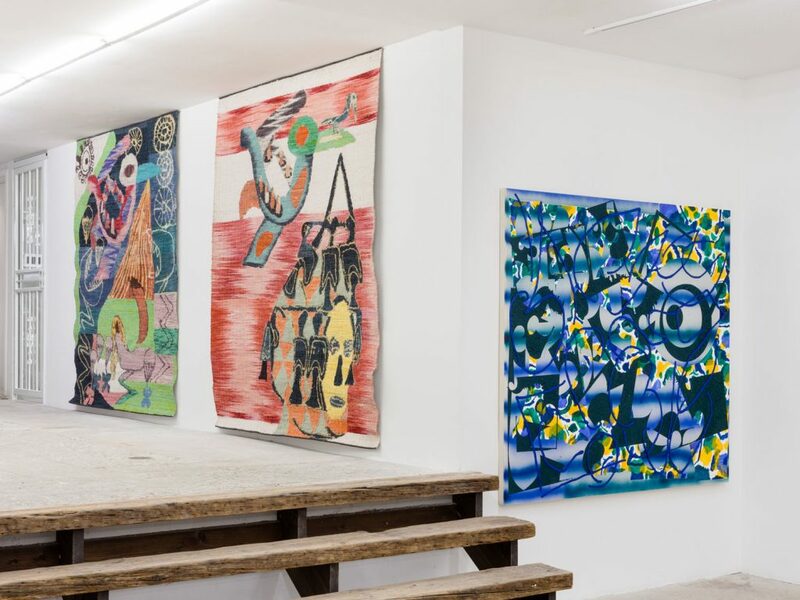 The aesthetic correspondence between these artists enables their affinities in thinking about art history and image rendering to also come to the fore. 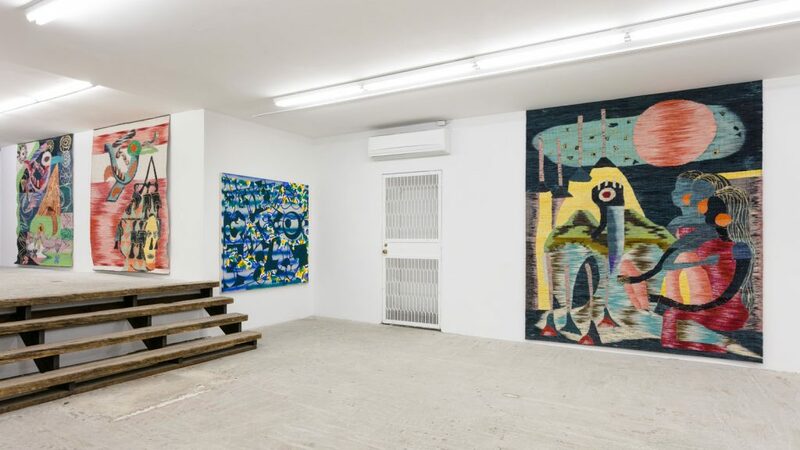 Trudy Benson & Yann Gerstberger ‘TT52’ Installation view at Lyles & King, New York, 2017. Acrylic, enamel, and oil on canvas, 32 x 37 inches. Cotton, natural dyes (grana cochinilla), synthetic dyes, vinyl banner, 113 x 94.5 inches. Acrylic and oil on canvas, 61 x 66 inches. Cotton, natural dyes (grana cochinilla), synthetic dyes, reclaimed vinyl banner, 82.5 x 71 inches.